Oh, hey, how's it going. Do you like chocolate and peanut butter? Of course you do. Everyone likes chocolate and peanut butter. Deb over at Smitten Kitchen made these the other day, and ooh, they looked good. Except I don't have any crispy rice cereal, and didn't want to make caramel, and instead was craving a shortbread kind of thing. So I went for it. First I tried to make a peanut butter fudge to go on top instead of just melted chocolate and peanut butter, but it didn't work out. I'm glad, because man these are so good. They are not good for you, although I guess you could argue that the peanut butter has protein. You could probably sneak in some flax seed into the crust, too. Preheat oven to 350. Line an 8x8 baking pan with a piece parchment paper, so that it overhangs a bit over the edges. 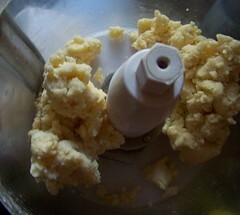 Pulse flour, xanthan gum, salt and sugars together in food processor, then add in butter and pulse for about a minute until crumbly. 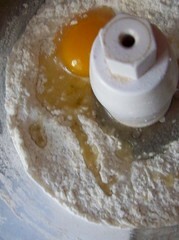 Add egg, and pulse about a minute until the dough comes together in the processor. 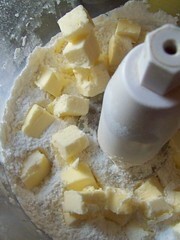 Press the dough into the pan, and bake for about 20 minutes until edges are lightly browned. Cool. Melt the chocolate and butter together, stir until smooth, and pour over the top of the chilled peanut butter layer. Let cool completely, and cut into small bars. Keep in the fridge. Mmmm...those bars are making me drool! Flax seeds in the crust sounds like a good idea. oh i love shortbread! my mom makes it around this time every year. and what way to make it even more perfect then by adding chocolate to it? YUM! !